These days, Moben Global Inc. released some new products at the requests of the public. These new products are the two-intelligent self-balancing scooters U1, the electric skateboard K1 and the electric scooter K2. The two-self-balancing scooter U1 looks like a mixture of K3 and U3. At first sight, the electric skateboard K1 bears a strong resemblance to the traditional skateboard. K2 shows its physical appearance familiar to the common electricity-assisted scooter. FOSJOAS U1 is equipped with a leather saddle, which is different from U3. The two-wheeled scooter U3 has not any saddle. With the comfortable saddle, FOSJOAS U1 will create a rosy ride even though the rider covers a long distance for a long time. The long-time ride will do no harm to fun in the process of riding. Another difference between U1 and U3 is that U1 gives up on the design of control shaft and U3 retains the design. Without the control shaft, the steering of performance of U1 does not drop off. On the contrary, the ease of control is still the future of U1. The absence in the control shaft forms a good view when the rider scoots about. 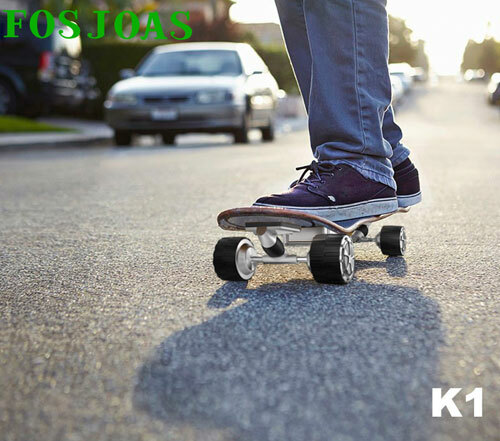 The original idea of FOSJOAS electric skateboard K1 is from the traditional skateboard. FOSJOAS K1 keeps the features of the traditional one. But the traditional skateboard can not be compared with K1 in both performance and technology. FOSJOAS K1 is also functionally superior to the traditional one. The traditional skateboard is utterly driven by labour force whereas FOSJOAS K1 is powered by electricity, which decreases a lot of efforts in riding. Compared with the traditional electricity-assisted scooter, FOSJOAS K2 electric scooter is as advanced as FOSJOAS K1. The traditional electricity-assisted scooter is far from foldable. FOSJOAS K1 cheap electric skateboard has a cut above it for it can pack away in the boot of the owner's private car. The shaft is adjustable and the pedals are foldable. When it pack away to its best, the size of K1 is extremely small.